Explore the wilder side of Kielder Water and Forest Park by using our family friendly walks and activities to take you to some of the secret spaces our wildlife loves. If you keep your eyes peeled and your ears alert, you might be quick enough to see some of our rare animals. Simply spend some time sitting in the dark stillness outdoors. A whole host of wildlife comes out at dusk: bats to eat the midges, rabbits to graze the grass, owls swooping across clearings. It is spellbinding and guaranteed to be a lasting memory of your stay. Download the ViewRanger App before you head to Kielder then follow some of our Wild Walks. Maybe you will choose the woodlands around Kielder Castle along to Kielder Salmon Centre and then Bakethin Nature Reserve. Have fun following our activity sheets, and trying the activities in Bakethin Nature Reserve’s Wild-it-up clearing, and don’t forget your binoculars for spotting your favourite woodland animals water birds at the wildlife hide, as well as relaxing on the wooden bench carved with otters, salmon and an osprey. Wild at Kielder geocaches are at key sites along the routes, helping you hunt out some of our natural treasures. Sign up and download the cache co-ordinates at www.geocaching.com. You can use your smart phone GPS to go geocaching and to use the ViewRanger.com walks app. You won’t need a phone signal or WiFi after you have downloaded them. Public WiFi is available at Kielder Castle, Kielder Waterside and Tower Knowe Visitor Centre. Pop into Kielder Waterside to peek through the telescopes of the Osprey Watch volunteers, and stroll through the wildlife garden and along the Beeches Trail to find the Red Squirrel watching hide. Kielder has the darkest skies in England, which means on a clear night you are able to see the Milky Way with your naked eye. Dark Sky Discovery Sites are scattered across the Park, visit www.darkskydiscovery.org.uk to find the nearest one to where you are staying, and remember to check for expert-led events too! For a different feel, move down to Kielder Dam to experience new habitats and wildlife from Hawkhope Car Park or Tower Knowe Visitor Centre. 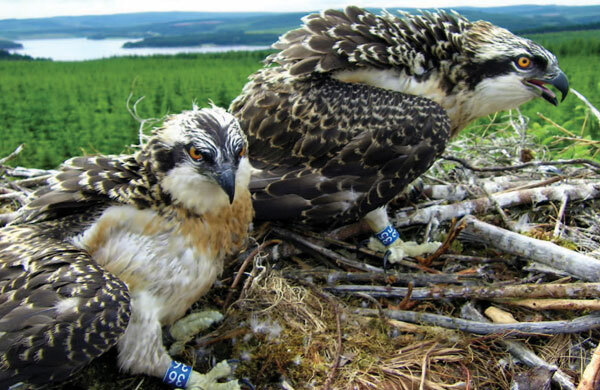 Feel close to the water in the Wave Chamber on The Belling, and between April and August you might spot one of our ospreys plucking a fish from Kielder Water – check out the osprey blog kielderospreys.wordpress.com for up to date information. The short walk up to Falstone Moss can be rewarded in early summer by glittering dragonflies and dainty carnivorous plants! Explore the lesser trod areas of Kielder Water and Forest Park, which are home to places of rare beauty with space for you to create your own adventures. At Falstone a circular walk along the riverside takes you to The Stell, and at certain times of year you can witness fish being released onto their migration from the Kielder Salmon Centre. Near Greenhaugh, ruined homes of the wild Tudor Border Reivers remain alongside stunning floral haymeadows. May to July are the best months to delight in the scents and colours of the flowers, and the glimmering wings of butterflies and insects pollinating them. In Stonehaugh, you can start walking from the stargazing pavillion upstream through meandering woodlands and alongside ancient earthworks. An important place for viewing wildlife with fine views across Bakethin Nature Reserve to the north and west and across the main body of Kielder Water to the south and east. Look for the former Border Counties railway on the north shore of Bakethin.